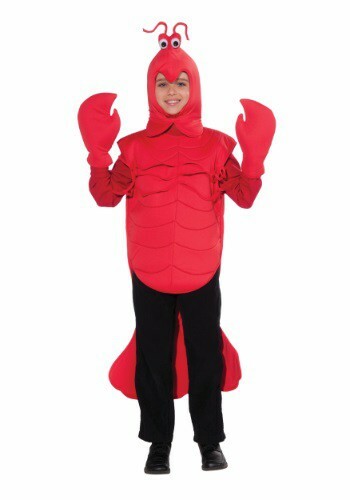 Keep a close eye on your kid when he wears this Child Lobster Costume. He may look good enough to eat...literally! French chefs and cooks across your neighborhood may just want to turn your little one into the main course of the next family dinner. Of course, the second they see your kid's adorable face poking out of the top, they'll fall in love with him and swear off seafood for life! We have it on good authority that Halloween is the one Holiday in which it's safe, in fact, to dress as a lobster without a horde of townsfolk chasing the giant lobster with forks and melted butter. This specific costume features a sleeveless, comfy, 100% polyester tunic that fastens with Velcro at the back of neck—for easy in-and-out, in case we're wrong about the hungry hordes. Similarly, the hood also fastens with Velcro at the back. But exercise caution when ordering: like lobsters themselves, this headpiece runs rather small. The best part? Foam lobster mitts! You'll want to pinch all the candy in the neighborhood in these bad boys.